A B61 bomb undergoing disassembly. The B61, known before 1968 as the TX-61, was designed in 1963. It was designed and built by the Los Alamos National Laboratory in New Mexico. It began from a program for a lightweight, streamlined weapon launched in 1961. Production engineering began in 1965, with full production beginning in 1968 following a series of development problems. Total production of all versions was approximately 3,155, of which approximately 1,925 remain in service as of 2014[update], and some 1,265 are considered to be operational. The warhead has changed little over the years, although early versions have been upgraded to improve the safety features. According to the journal "Physics Today", September 2013, page 45, there are 200 B61 bombs actively in use by the United States. Nine versions of the B61 have been produced. Each shares the same "physics package", with different yield options. The newest variant is the B61 Mod 11, deployed in 1997, which is a ground-penetrating bunker buster. The B61 unguided bomb should not be confused with the MGM-1 Matador cruise missile, which originally was developed under the bomber designation B-61. When the B61 was still classified, aircrew were not allowed to use the term "B61". Instead, it was referred to as a "shape", "silver bullet", or even "external delivery". The B61 has been deployed by a variety of U.S. military aircraft. Aircraft cleared for its use have included the B-1 Lancer, B-2 Spirit, B-52 Stratofortress; F-101 Voodoo, F-100 D & F Super Sabre, F-104 Starfighter, F/A-18 Hornet, F-111 Aardvark and F-4 Phantom II fighter bombers; A-4 Skyhawk, A-6 Intruder and A-7 Corsair II attack aircraft; the F-15 Eagle, F-15E Strike Eagle and F-16 Falcon; British, German and Italian Panavia Tornado IDS aircraft. USAFE and all NATO dual role aircraft can carry B61s. The Lockheed S-3 Viking was also able to deploy the B61 as a nuclear depth bomb. The B61 cannot fit inside the F-22 Raptor's weapons bays and will instead be carried by the Lockheed Martin F-35 Lightning II. Though exact numbers are hard to establish, research done by the Natural Resources Defense Council suggests approximately 180 are deployed with United States Air Force Europe units. As of 2015[update], they are deployed in Europe under the NATO nuclear sharing arrangement. NATO has agreed to vastly improve the capabilities of this force with the increased accuracy of the B61 Mod.12 upgrade and the stealthy delivery of the F-35. Internal nuclear components of the B61 bomb. The bomb was assembled at the Burlington AEC Plant and Pantex. 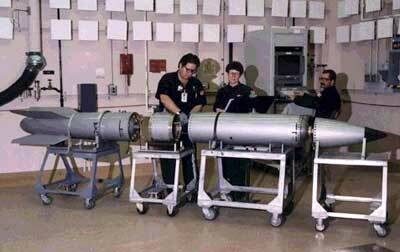 The B61 is a variable yield bomb designed for carriage by high-speed aircraft. It has a streamlined casing capable of withstanding supersonic flight speeds. The weapon is 11 ft 8 in (3.58 m) long, with a diameter of about 13 in (33 cm). Basic weight is about 700 lb (320 kg), although the weights of individual weapons may vary, depending on version and fuze/retardation configuration. B61 administrative procedures performed by ground-based personnel are executed via an access panel located on the side of the bomb, which opens to reveal 9 dials, 2 sockets and a T-handle which manually triggers the "command disable" function. One of the sockets is a MC4142 "strike enable" plug which must be inserted in order to complete critical circuits in the safety/arming and firing mechanisms. The other socket is the PAL connector located in the top right hand corner of the arming panel, which has 23 pins marked with alphabetic letter codes. On at least one design of B61 warhead the destructive yield of the bomb is adjusted via a dial marked "Option", which allows 6 settings ranging from A to F. The B61 also features a "command disable" mechanism, which functions as follows: after entering the correct 3-digit numeric code it is then possible to turn a dial to "DI" and pull back a T-shaped handle which comes away in the user's hand. This action releases a spring-loaded firing pin which fires the percussion cap on an MC4246A thermal battery, powering it up. Electrical power from the thermal battery is sufficient to "fry" the internal circuitry of the bomb, destroying critical mechanisms without causing detonation. This makes the bomb incapable of being used. 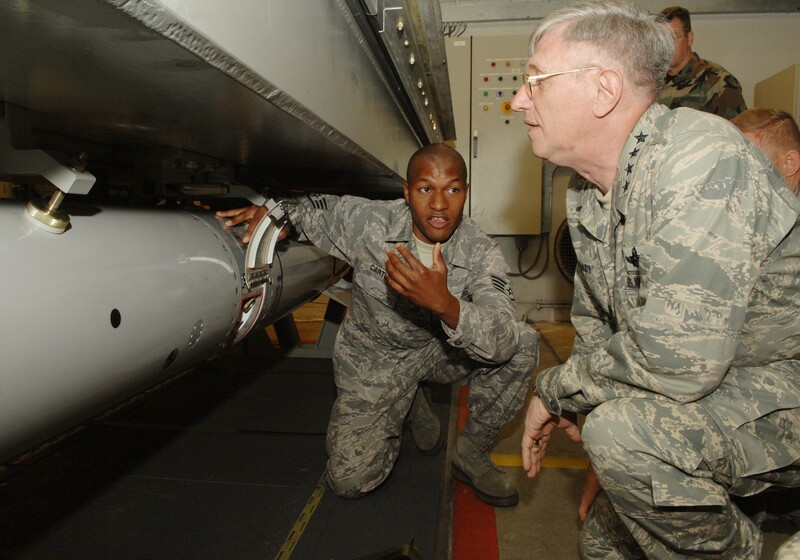 Any B61 which has had the command disable facility used must be returned to Pantex for repair. Most versions of the B61 are equipped with a parachute retarder (currently a 24-ft (7.3 m) diameter nylon/Kevlar chute) to slow the weapon in its descent. This offers the aircraft a chance to escape the blast, or allows the weapon to survive impact with the ground in laydown mode. The B61 can be set for airburst, ground burst, or laydown detonation, and can be released at speeds up to Mach 2 and altitudes as low as 50 feet (15 m). The B61 is a variable yield, kiloton-range weapon called "Full Fuzing Option"(FUFO) or "Dial-a-yield" by many service personnel. Tactical versions (Mods 3, 4, and 10) can be set to 0.3, 1.5, 5, 10, 60, 80, or 170 kiloton explosive yield (depending on version). The strategic version (B61 Mod 7) has four yield options, with a maximum of 340 kilotons. Sources conflict on the yield of the earth-penetrating Mod 11; the physics package or bomb core components of the Mod 11 are apparently unchanged from the earlier strategic Mod 7; however, the declassified 2001 Nuclear Posture Review states that the B-61-11 has only a single yield; some sources indicate 10 kt, others suggest the 340 kiloton maximum yield as the Mod 7. The early Mods 0, 1, 2, and 5 have been retired (Mods 6, 8, and 9 were cancelled before production), and the Mod 10 has been moved to the inactive stockpile, leaving the Mods 3, 4, 7, and 11 as the only variants in active service. The U.S. intended to refurbish the B61 bombs under its Life Extension Program with the intention that the weapons should remain operational until at least 2025. However, the United States Congress ordered that this work be stopped, pending reports from the National Academy of Sciences and JASON defense advisory panel. In May 2010 the National Nuclear Security Administration asked Congress for $40 million to redesign the bomb to enable the Lockheed Martin F-35 Lightning II to carry the weapon internally by 2017. This version is designated Mod 12. The four hundred B61-12 bombs will be used by both tactical aircraft (such as the F-35) and strategic aircraft (such as the B-2) and the Tail Subassembly (TSA) will give them Joint Direct Attack Munition levels of accuracy, allowing the fifty kiloton warhead to have strategic effects from all carrying aircraft. However, refitting the 400 weapons is now expected to cost over $10 billion. The B61 Mod 12 tail assembly contract was awarded to Boeing on November 27, 2012 for $178 million Boeing will use their experience with the Joint Direct Attack Munition to yield JDAM equivalent accuracy in a nuclear bomb. This contract is only the first part of the billion dollar expense of producing and applying the tail kits, over and above the $10 billion cost to refurbish the warheads. 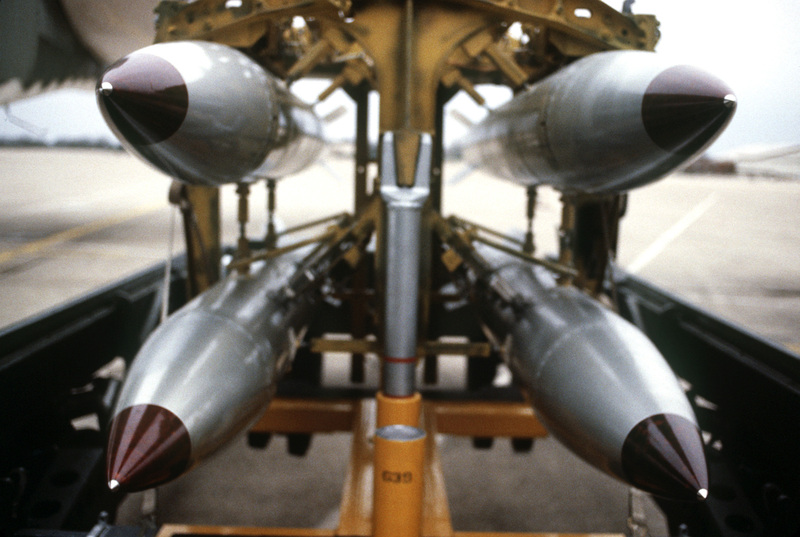 B61s on a bomb rack. ↑ "The B61 Bomb". Nuclearweaponarchive.org. http://nuclearweaponarchive.org/Usa/Weapons/B61.html. Retrieved 2012-06-09. ↑ "US nukes to stay in Germany – media". 06 September, 2012. http://rt.com/news/germany-us-nukes-upgrade-519/. ↑ Kristensen, Hans M. "New Report: US and Russian Non-Strategic Nuclear Weapons." FAS, 2 May 2012. ↑ Borger, Julian (21 April 2013). "Obama accused of nuclear U-turn as guided weapons plan emerges". The Guardian. http://www.guardian.co.uk/world/2013/apr/21/obama-accused-nuclear-guided-weapons-plan. Retrieved 11 June 2013. ↑ "Glenn's Computer Museum-B61 Preflight Controller". Glennsmuseum.com. http://www.glennsmuseum.com/controller/controller.html. Retrieved 2012-07-08. ↑ "the nuclear information project: the B61-11". Nukestrat.com. http://www.nukestrat.com/us/afn/B61-11.htm. Retrieved 2012-06-09. ↑ Grossman, Elaine M. (September 26, 2008). "U.S. Air Force Might Modify Nuclear Bomb". GlobalSecurity.org. http://www.nti.org/d_newswire/issues/2008_9_26.html#B8705677. ↑ Kristensen, Hans. "B61-12: NNSA’s Gold-Plated Nuclear Bomb Project." FAS, 26 July 2012. ↑ "Boeing Receives $178 Million Contract for B61 Tail Kit Assembly." ↑ Kristensen, Hans. "$1 Billion for a Nuclear Bomb Tail." FAS, 12 April 2013. Wikimedia Commons has media related to B61 nuclear bomb.